The ThINKin' Spot: Peachy Keen Challenge 13:13 :: 3-D Objects :: Oh Baby! Peachy Keen Challenge 13:13 :: 3-D Objects :: Oh Baby! Hello friends! Happy Friday to ya as well! I guess it IS Good Friday, isn't it? WOW! Where does the time go? For what I would consider a long, cold and snowy winter for us, it sure seems like it has moved fast. We are SO ready for Spring around here, and it looks like we might get a wee taste of it before the rain/snow mix comes along later this weekend. I hope you and yours have plans for a fabulous Easter. Ours will be an early morning of preparing for Sunrise Breakfast at church, followed by a yummy dinner, some Easter Egg Hunting (weather permitting). Sounds like a pretty sweet time to me! I've got a fun little project to share with you today. I say "little", but actually it took me a bit to get this one together. Nothing difficult at all. Just a little labor intensive. 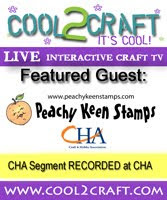 I made this for the new challenge for this week at the Peachy Keen Stamps Challenge Blog. The challenge this week is to do a 3-D project pertaining to babies. Heaven knows we've got plenty of diapers around here, so I thought a diaper cake might be just the ticket! The gate fold card on top of the cake is a file that I purchased from Kadoodle Bug Designs. PKS had a cross promotion with them a few weeks ago, and I really fell in love with so many of their adorable images. If you haven't used SVG files, I have to say you SHOULD! Yet another addiction in this crazy paper crafting business! All of the stamped images come from the PKSC-15 March 2013 Stamp of the Month stamp set from Peachy Keen Stamps. Everything was colored with Copic Markers, and I think everything else here is pretty self explanatory. I punched the sweet little faces out using 1 1/4 and 1 3/8 inch circle punches. They were stamped on white card stock with memento ink, and colored with Copics before they were punched. The paper was a part of some randomly discounted stacks that I purchased at my local Ben Franklin store, so I'm not exactly sure what the brand is. I did add some rosy cheeks to the sweet baby faces using chalk and a stiff bristle paint brush. Drop by The Peachy Keen Challenge Blog to find some wonderful inspiration from the rest of the designers. If you've get the chance we'd all love it if you could play along with us! We LOVE seeing your work!! Thanks for stopping by today! Have a great day and a GLORIOUS Easter! How incredibly sweet! Love the card and the little faces peeking around the cake! Very cute indeed! Lorie, your diaper cake is adorable! Love that you used your card as the cake topper, and all those cute peachy faces areound the cake is soo cute! This is FABULOUS Lorie! I love how you decorated the diaper cake and that fantastic card at the top! Too cute! How sweet! Any new Mama would love to get this!